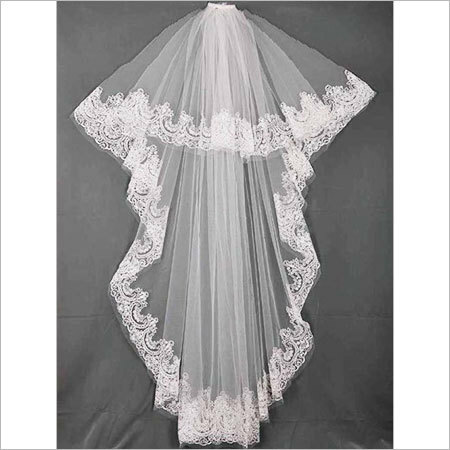 Wedding Veil is an inseparable part of a traditional wedding Gown. 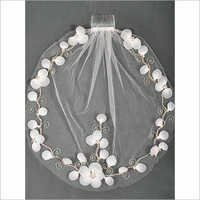 It gives a stunning and sizzling look to your bridal gown. 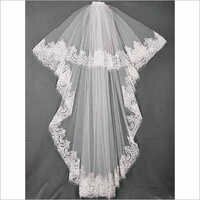 We are reckoned among some prominent wedding veil manufacturers, hand embroidery veil suppliers, and exporters of Indian domestic market. We bring an unique bride veils collection, which are exclusively and exceptionally made by our highly creative designers who put their 100% potential in these veils. 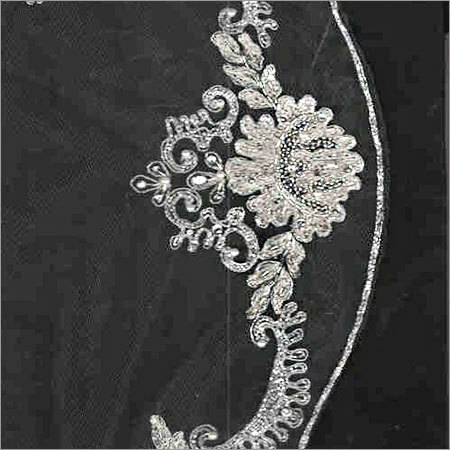 With our mission to flawless quality products to clients in a stipulated time period, we have become the most promising Hand embroidery veil suppliers. The embroidery is done using silk thread. 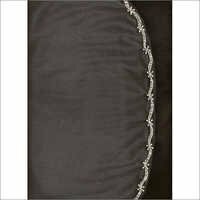 The veil is also available in silver or gold metallic thread embroidery. 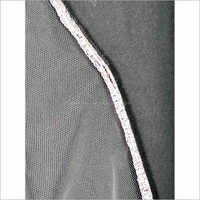 Our clients can avail these products in different sizes which are elbow, fingertip, chapel, cathedral in single or double layers. We manufacture flawless range of floral applique veil. 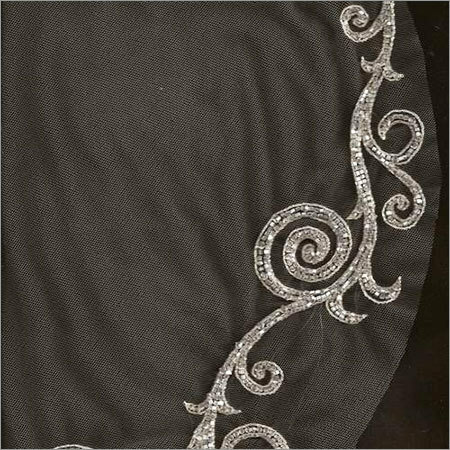 We design and develop our range of Veil using swarovski crystals, japanese pearls and czech beads.The veil is available in white , diamond white and ivory colors. Clients appreciate and demand our veil collection throughout the year. 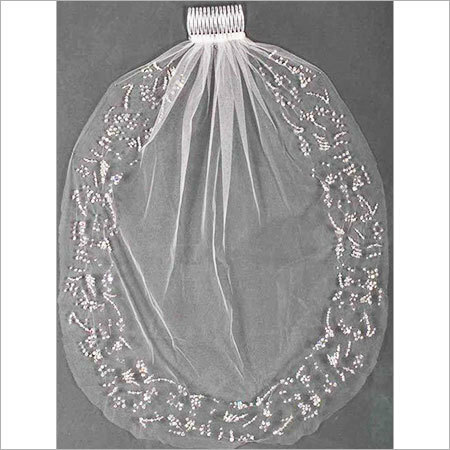 Owing to our experienced team of designers and craftsman, we offer an quality assured range of Swarovski Crystal Veil. These veils are an integral part of the whole ward of any women. Our esteemed clients attain extreme satisfaction, due to our product's flawless quality. These veils are completely wrinkle free and does not tarnish in the years to come. These can be availed in various lengths and can be customized as per our customer's requirements and specifications. 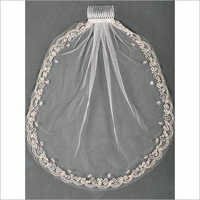 This is a simple edge wedding veil that will match any kind of wedding dress, whether a train dress or a ball gown. Color: white, , can be made in any color. Material Used: Swarovski pearls & stones, Czech & Japanese glass beads & silk matching thread. Fabric: American Diamond White Tulle. Size: In any size as per the order placed to us, Cathedral, Fingertip, Chapel, and Blusher. 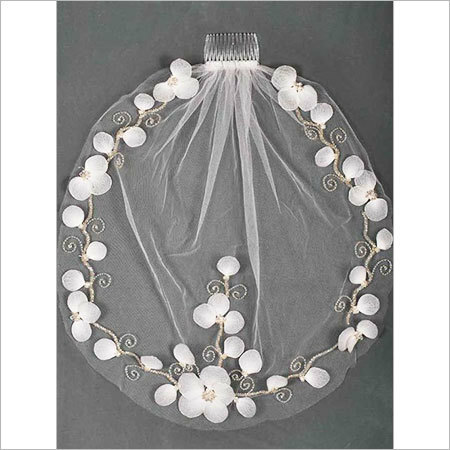 This simple wedding veil is made up of pearls & diamantes, which will match for any kind of gown when worn. As fashionable products to our clients, that makes wedding dress complete wit favorable price. Color: white, Blue, Red or in any colors. 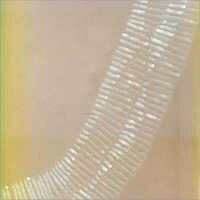 Material Used: Japanese Glass Beads, Japanese Pearls & Czech & silver thread. Fabric: American D. White Tulle. 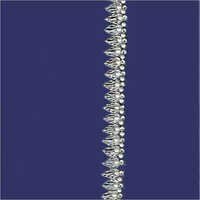 We offer a wide spectrum of Silver Thread Cord Embroidery Veil to our esteemed clients. 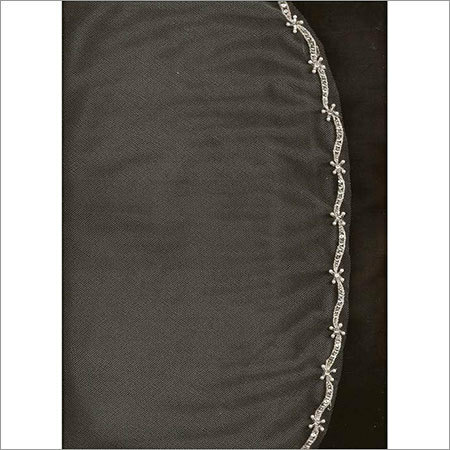 This is an elaborate edge veil highlighted with Swarovski Diamantes & Czech beads. 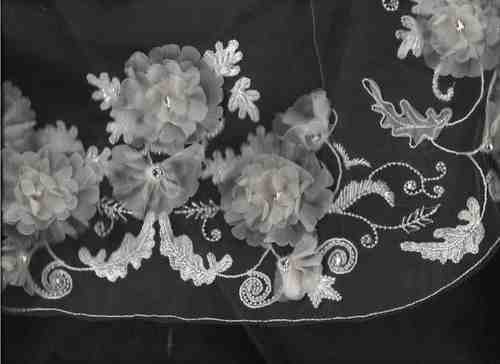 This veil has silver cord work & is completely hand embroidered and beaded. 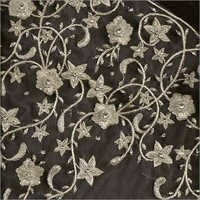 We as an eminent exporter of Silver Thread Cord Embroidery Veil, have gained immense popularity in the domestic market. To add some more glory to your wedding gown, we introduce an exquisite collection of Sequin Veil. Our designed veil is fully skilled hand beaded embroidery which has a wide border of sequin. 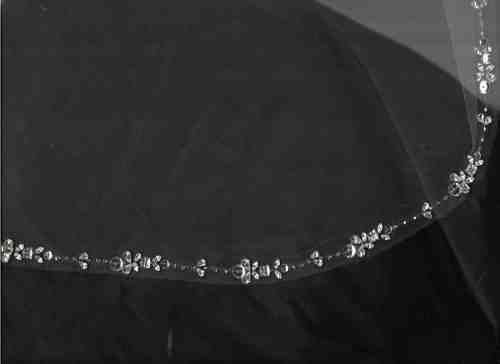 We have used different colors of sequin to craft beautiful pattern in the veil. Furthermore, we are we are backed a competent team of craftsman who put in their 100% to design our product line. 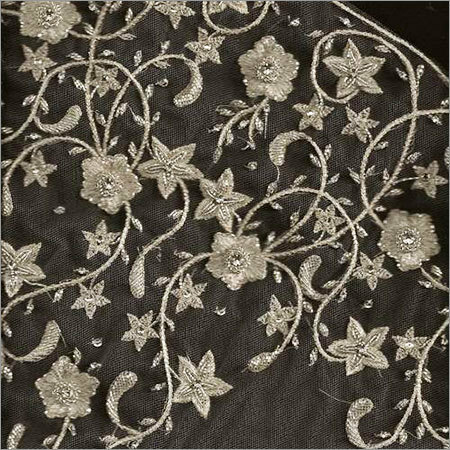 This Embroidery wedding veil is completely made up of precious Swarovski tiny crystals, which reach the expectation in glorifying veil at ceremony. 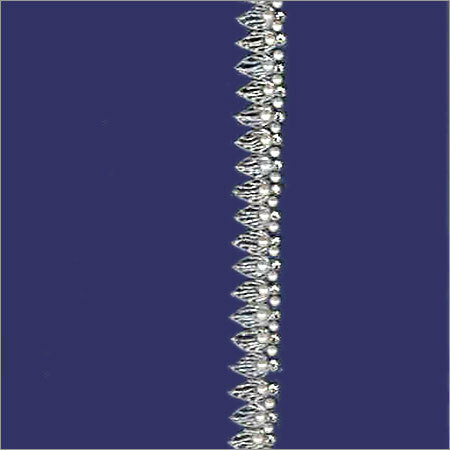 Material Used: Tiny Swarovski crystals of size 2.5mm. 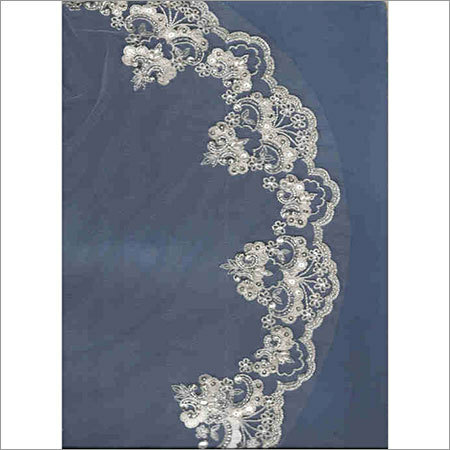 Fabric: : American Diamond White Tulle. 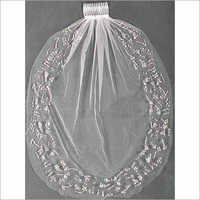 We are providing our customers a wide range of Designer Bridal Veils. Our products are designed using raw material which is skin-friendly and are of optimum quality. These are specially designed and bear an elegant look.. Our products are widely available at industry leading prices. Color: white, can be made in any color. Material Used: Swarovski crystals, pearls & stones, Czech & Japanese glass beads & silk matching thread. 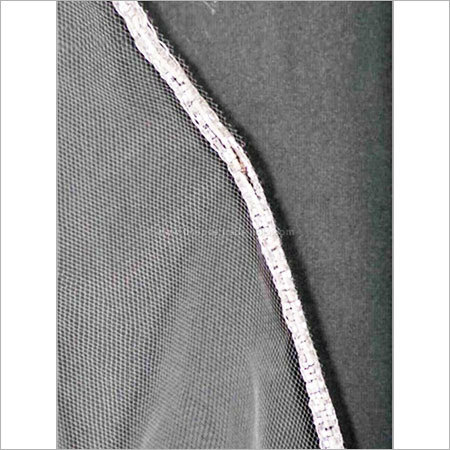 Fabric American Diamond White Tulle. We are specialized in creating very complicated and classy designs. The above flower veil is a great example of what we can achieve even on a delicate fabric like tulle. Material Used: Plastic sequins, Czech beads. This bridal veil is designed with flowers at the center that follows till the border. 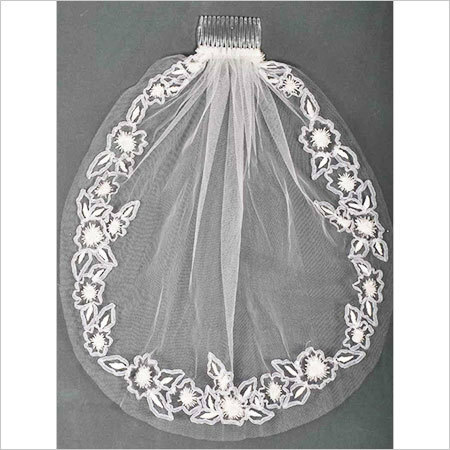 This veil is very classy and can be worn with a simple gown. The delicate embroidery on the veil will enhance the look of any gown. Material Used: Japanese glass beads & Czech Glass crystals, plastic sequins, Czech beads & Swarovski crystals. 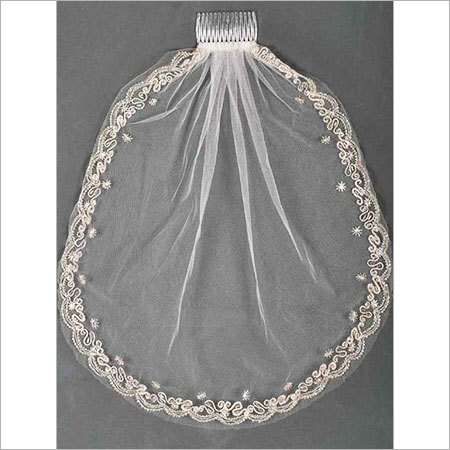 This simple wedding veil is made up of pearls & diamantes, which will enhance the beauty of any gown. It is simple yet shiny. This is a simple wedding veil that will match any kind of wedding dresses weather it may be a train dress or a ball gown. Materials Used: Swarovski Stones, Japanese Glass Beads & silk Matching Thread. The reason for our success over the years has been honest business practices with stringent quality control and adherence to delivery times.